Hyde Park is one of the largest parks in central London, England and one of the Royal Parks of London, famous for its Speakers' Corner. The park is divided in two by the Serpentine. The park is contiguous with Kensington Gardens; although often still assumed to be part of Hyde Park, Kensington Gardens has been technically separate since 1728, when Queen Caroline made a division between the two. 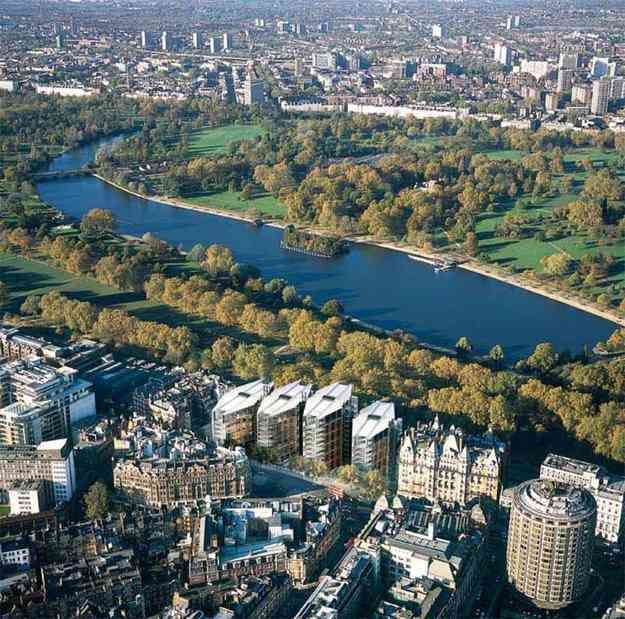 Hyde Park is 142 hectares (350 acres) and Kensington Gardens is 111 hectares (275 acres), giving an overall area of 253 hectares (625 acres), making the combined area larger than the Principality of Monaco (196 hectares or 484 acres), but smaller than New York City's Central Park (341 hectares or 843 acres). To the southeast (but outside of the park) is Hyde Park Corner. Although, during daylight, the two parks merge seamlessly into each other, Kensington Gardens closes at dusk but Hyde Park remains open throughout the year from 5 am until midnight. The park was the site of The Great Exhibition of 1851, for which the Crystal Palace was designed by Joseph Paxton. Hyde Park ca. 1833: Rotten Row is "The King's Private Road".The park has become a traditional location for mass demonstrations. The Chartists, the Reform League, the Suffragettes and the Stop The War Coalition have all held protests in the park. Many protestors on the Liberty and Livelihood March in 2002 started their march from Hyde Park. On 20 July 1982 in the Hyde Park and Regents Park bombings, two bombs linked to the Provisional Irish Republican Army caused the death of eight members of the Household Cavalry and the Royal Green Jackets and seven horses. 1. Diana Fountain - Memorial toDiana, Primncess of Wales, opened by the Queen in 2004, Designed to reflect Diana's life and character. 2. July Memorial - 52 pillars represent the people killed in july 7th bombings in London 2005. 3. Serpentine bar and Kitchen - Recently refurbished licenced restaurant selling hot and cold meals, snacks and drinks. Open 8AM - 8PM. 4. The Lido - The Lido cafe is currently closed for refurbishment. The nearest cafe is The serpentine Bar and kitchen. A brand new style cafe will be opening Easter 2010. 5. Serpentine Boad hire - From easter-October, rowing and pedal boats are for hire from the Boat house and trips on the solar-powered ferry. 6. Speaker's corner - People have had a legal right since 1872 to speak publically here about anything, provided they dont use obscene language. 7. Tennis centre - Six courts, changing rooms, cafe and bowling green. Turn up and play or become a member. Coaching and tournaments available. The park is open from 5am until midnight all year round. For information about the exhibitions and tickets please visit the website. Trooping the Colour –The Major General’s Review. For tickets and information call 020 7414 2479. Annual Last Night of the Proms outdoor concert with an additional Concert on the Sunday. Gates open 4.00pm Entertainment on stage from 5.30pm Corporate hospitality facilities: call Charles Webb on 01484 437422 or visit Sellers Hospitality Tickets: £25.00 (under­3s free) Family and Friends ticket offer: buy 7 tickets and get the 8th ticket free! Book your tickets: By phone on 0844 412 4630* Online via See Tickets In person from the Royal Albert Hall (Door 12, 9.00am-9.00pm) A £2.00 transaction fee applies to tickets purchased through See Tickets. There is no transaction fee for tickets purchased in person at the Royal Albert Hall. *Calls from a BT landline are charged at local rate; charges from mobiles and other networks may be higher. The Queen’s Birthday Parade on Horse Guards Parade. Colour trooped by the 1st Battalion Welsh Guards. Tickets £20. Tickets on application to the Brigade Major, HQ Household Division. Horse Guards SW1A 2AX .For information phone 020 7414 2479. The Massed Bands of the Household Division perform on Horse Guards Parade on Wednesday, 4th & Thursday, 5th June. For tickets and information call 020 7839 5323. Supported by Motorhead, Queens of the Stone Age and more Local residents hotline The Royal Parks work hard to minimise any inconvenience to City of Westminster residents as a result of events in the Parks. If however you do need to report any problems during this event you can contact a member of Royal Parks staff on 07896 296941. Please note this telephone number is only operational during the event. Join a galaxy of international stars from the political to the musical, in celebration of Nelson Mandela's 90th birthday. The UK’s first ever outdoor film festival, set inside one of the most beautiful parks in the UK. Open air film screenings, live music and entertainment. Local residents hotline The Royal Parks work hard to minimise any inconvenience to Greenwich residents as a result of events in Greenwich Park. If however you do need to report any problems during this event you can contact a member of Royal Parks staff on 07896 290721. Please note this telephone number is only operational during the event. The world’s greatest restaurant festival is back this summer in Regent’s Park from June 18-21. For four full days, famous chefs from the capital’s best restaurants will be on hand to serve up their signature dishes and share their best kept kitchen secrets while 150 star food and drink producers dish out the samples and top up your glass. Taste of London: the ultimate day out for the discerning foodie. Musical spectacular with Royal Marines Beating Retreat on Horse Guards Parade. Spectacular new stage production of J M Barrie's classic story performed in a specially commissioned, state-of-the-art theatre pavilion. Join the Massed Bands of the HM Royal Marines for the Beating Retreat, a magnificent pageant of military music, precision drill and colour in the beautiful setting of Horse Guards Parade in the heart of London. Family orientated festival, village fete style. Head along to a delightful range of activities including duck herding, alfresco dancing, welly wanging, funfair rides and live music. The Friends of Greenwich Park and Garden Opera Company present Mozart's most powerful opera. The annual Holly Lodge Christmas Ball - to be held at NEC Harlequins, Twickenham, starting at 7pm. Join us for an evening of Music, Poetry and Song staged in The Belvedere, Pembroke Lodge, Richmond Park. On 17 June an Open Air Concert, featuring TENORS Un LIMITED is being held in the gardens of The Royal Ballet School. An evening of music and words in Richmond Park The Holly Lodge Centre is holding an evening of music, poetry and storytelling to raise funds for the centre. The theme for the evening will be People of the Park. Paddy Hughes will read his poems with actress Jacki Piper. Music will be provided by mezzo-soprano Annabelle Cheetham & flautist William Morton. Piano accompaniment by Anthea Weale and storytelling by Giles Abott. Other performers to be announced in due course. "Old Friends" in concert. This is one of only two UK shows. Red Bull Flugtag is back! A uniquely loony competition where 40 daredevil teams fly their man-made, man-powered flying machines off a 6 metre high ramp into The Serpentine. Teams will be judged based on the distance their machine flies, the creativity of their machine and their pre-flight performance. The White Stripes supported by Queens of the Stone Age. Her Majesty The Queen’s Birthday Parade. The Colour will be Trooped by the 1st Battalion Irish Guards. FATBOY SLIM, UNDERWORLD, BOOTSY COLLINS... does it get any better than this? Saturday night at this year's O2 Wireless Festival is shaping up to be a non-stop dance extravaganza... We are happy to welcome Kiss as the radio partner for this very special Saturday of the world’s best dance music at this year's event. COUNTING CROWS, Ben Harper and the Innocent Criminals, Powderfinger... we're delighted at the line up for the closing night of O2 Wireless Festival 2008... Sunday night looks set to be a night of great music and musicianship as we welcome the worlds top acts from the US and Australia. The 25th anniversary of the Falklands Campaign will be commemorated across 8,000 miles and five time zones, in London and the Falkland Islands on 17 June 2007. This will be a high impact visual event on Horse Guards Parade and will include a traditional “Drumhead” ceremony. This will be followed by a parade of veterans and their modern day service counterparts up The Mall to Buckingham Palace to witness a fly past of aircraft from the Falklands era as well as some of those flown by the same squadrons today. Central to the event will be the personal recollections of veterans and Islanders as they tell their stories in their own words. Senior members of the Royal Family will attend, and it will be covered live by the BBC. The Police, following their hugely succesful world tour, are to headline with special guests KT Tunstall and Starsailor. Further acts to be added to the bill. Presented by Rainbow Shakespeare. Evening performances start at 6.30pm. Saturday matinee starts at 2pm. Hip-Hop supremo, JAY-Z is the biggest, the best, the baddest and he is here on the Main Stage for what will undoubtedly be one of the performances of the year. In addition we are thrilled to confirm that you'll also be able to catch Mark Ronson, Hot Chip, and Roisin Murphy performing on the same night in Hyde Park. The Open Air Theatre is not just about an amazing atmosphere, it is about remarkable storytelling too, and this year they will be featuring mesmorising performances of Shakespeare's 'Romeo & Juliet', 'Twelfth Night' and 'A Midsummer Night's Dream', as well as Lerner and Loewe's 'Gigi'. We recommend that visitors avoid coming by car as there are limited places. Pay and Display parking is available on West Carriage Drive and in Car Parks at either end of Serpentine Bridge. As part of our commitment to improving access to Hyde Park, separate pedestrian and vehicle entrances will be created over the next two years. Due to construction of the One Hyde Park Development Edinburgh Gate is now closed, a dedicated Pedestrian access will be opening in 2010 to the East of the current Edinburgh Gate location. Serpentine Bar & Kitchen - Recently refurbished licenced restaurant selling hot and cold meals, snacks and drinks. Open 8AM - 8PM. The Lido - The Lido cafe is currently closed for refurbishment. The nearest cafe is The serpentine Bar and kitchen. A brand new style cafe will be opening Easter 2010. Tennis centre - Located in the tennis and sports centre, the cafe offers welcome refreshments for players and spectators alike. There are toilets, and a garden with seating. Refreshment Point - A range of hot and cold snacks, sandwiches together with tea, and coffee, cold drinks and ice creams available. there are a number of such refreshment points in the whole park. 1, Is Hyde Park a good place to visit ? Ans : I will just give you my comments and you decide. I had been there yesterday ( 6th April 2010 ) a day before Easter (today), with my wife. Luckily it was nice and sunny most of the day. Since I stay in Hounslow West, we took an underground tube from Picadilly Line to Hyde park Corner. As soon as we came out of the station to the ground level we could see it in front of us. I guess the tube runs just below Hyde park. It is a very huge place. There are many gardens and nice green lands. inside the park there are proper roads made which I guess are for people with roller skates as I saw many people skating on their roller skates. There is a beautiful lake inside not much far from the tube station. We booked a paddle boat and spent most of our time in it. It was very relaxing. It costed us £9 for one hour. The price for half an hour was £7. There were rowing boats as well. It is very safe there. they also provide life jackets. There is a restaurant adjacent to the lake. It is called The serpentine bar and Kitchen. It seemed a nice restaurant but we didnt eat there. There was another food shop adjacent to the Lake. Where we had hot dogs, carrot cake and coffee. It was a coffee shop. There are many seats available to sit and watch the lake peacefully sitting in sunshine. There were also some rocking chairs for hire on a lush green lawn in front of the lake. i could see the price as £1.50 for 1 hour i guess (I am not sure of the time). Adjacent to the concrete road for roller scates is also a road od sand / mud for the horses. there are loads of other things in Hyde park but we thought of coming back as my wife was little tired. So we walked out and immediately after some time could see the Buckingham Palace. So we took some pics there. You could visit Buckingham palace if you plan to visit Hyde Park and vice versa.